Designed for comfort and with your little one's needs in mind, this baby walker is a breeze to set up, clean, fold and most importantly, easy for your baby to use. This activity walker features 4-position height adjustment. A high seat back provides comfort and support for baby and 4 height positions allow it to grow with baby. 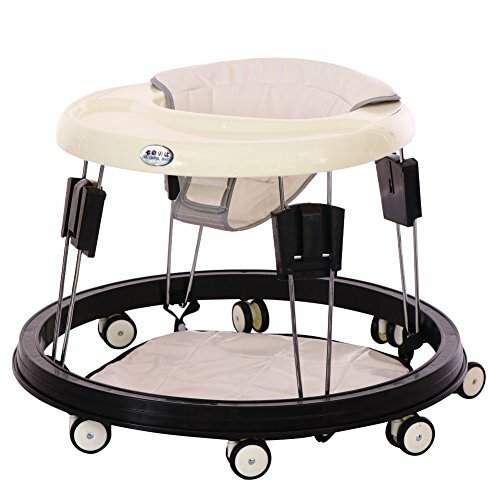 Along with the multi-directional wheels that offer freedom of movement, the extra wide base provides superior support and stability so your baby can be confident as they navigate new grounds. The large surround tray provides plenty of space for snacks and play! Adjustable Height. 8 adjustable height positions suit for the growing baby. The walker also sets up easily, with no tools required. Folds flat for easy storage and travel. Easy to Clean. Seat and frame easily wipe clean, so there's less worry about messes or stains. Top: 18.50 inch(47cm). Bottom: 24.41 inch(62cm). Height: 16.54 inch(42cm). For baby 6 to 18 month who is 23.62" to 33.86" (60-86cm) in height. Seat pad is adjustable and comfortable. Unique wide base designed for superior stability. Sturdy wheels offer freedom of movement, can be used on carpet, tile, or wood floors. The large surround tray provides plenty of space for snacks and play. Bearington Baby Shower Gift Set for Boys Includes Lil' Waggles Plush Stuffed Animal Blue Puppy Dog Soft Ring Rattle, 5.5" & Dottie Snuggle Receiving Blanket (Blue), 28.5" x 28.5"